Discussion in 'Other Pets & Livestock' started by ma2babygurl13, Jan 2, 2011. Here is the scoop I had a kitten I had rehomed several months back. Since then I rescued "rags" from my parents farm she had lived outside for the past 7 years, she can be quite rotten attitude wise at times. She has adjusted well to life on the inside. I have now been contacted by "mater"'s adopter to take him back. He is about 8 months old. He is unaltered, and was quite rambunctious when he left here. "rags" is fixed, and I plan to get "mater"fixed soon after coming back. My husband is opposed to the Idea of him coming back. But his adopter went to CA for Christmas and has decided to stay there leaving "Mater" homeless (he is currently staying with his adopter's friend but she cannot keep him) She says if he doesn't find a home by Tuesday she is sending him to the shelter as a stray... SO my question is, what is the best way to get "Mater" and "Rags" accustomed to sharing the house together with out too much of a struggle. Or would it be in the best interest to say see ya later mater and hope he finds a home? I would introduce them like this..." Mater, this is Rags". "Rags this is Mater" Sorry, the devil made me do it! 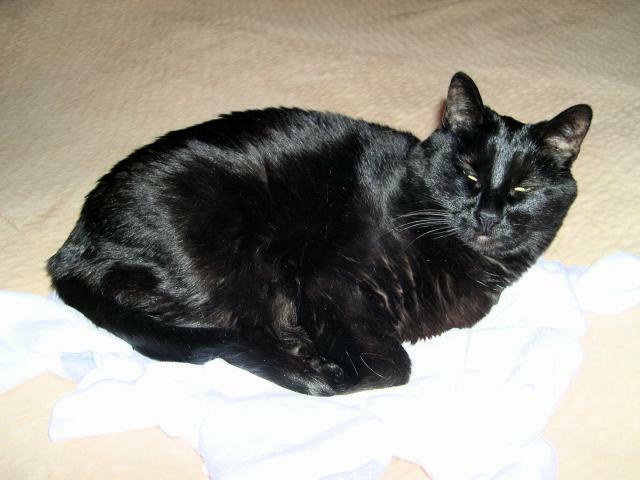 I have a cranky fixed female indoor cat who is presently adjusting to a younger fixed male, recently introduced. Both are allowed out when they want, but they don't want if it is cold or raining. They chase and hiss and growl, but no bloodshed, and they've had a couple of weeks. I don't suppose they'll ever be friends because the female is such a jerk, but they are tolerating each other and sharing (not at the same time) a single litter box and dry food bowl. I keep a water squirt bottle handy and squirt for growling and hissing if I get a chance, though usually one sees me reach for it and runs off. I figure they'll both survive. Like rub mater down good with a hand towel... then let the other cat smell it... just leave it out all day for him to keep smelling. Your biggest problem is probably that the one is still unneutered. If that could be done muy pronto, like before you take him home, it'd be better... but it does not sound like your friend's timeline is flexible enough for that. That being the case, I'd suggest getting him altered on the way home if at all possible (but, seriously) and then keep him in a separate room for a few days to get over the surgery. Then you can either go the slow and cautious route -- put up a temporary screen or glassed door between the two, and introduce each separately to the other's part of the house, and so forth and so on -- or just say ah the heck with it and open the door and see what happens. I've done it in pretty much all possible ways over the years and have come to the conclusion that "they're cats". They are inexplicable and do whatever they want, no matter what YOU do. Truthfully the eight or so cat introductions I've done have all turned out some variety of very well in the end, although sometimes the first days or weeks were a bit lumpy. As long as your house or apartment is not teeny and there are places for cats to get away by themselves -- particularly if there are *vertical* places to go, like atop furniture or kitchen cabinets, they really like that -- then I think the chances of it working out for you are pretty good. First thing is to get the boy neutered asap. Before you bring him into the house if at all possible. If he starts marking, it may continue even after neutering. then I'd keep him in a separate room for a while, door closed. Let your cat sniff him under the door and vice versa. Get him used to you - go up to his room, play with him, pet him, etc. Make sure you give your girl attention, too. Introduce them slowly, in a controlled environment, if you can. There will be hissing, growling, even some chasing and fighting. Just don't let anyone get hurt and they will work it out. I have 4 now, and when we got the latest, it was a couple months before they all settled down, and they are not all best friends, but they do get along. Patience, patience and more patience.